The Metropolitan Branch Trail (MBT)is a great transportation assets for the District. For it to reach its potential; however, trail users, advocates and the community that surrounds the trail must determine what the the future of the trail should be and how we can make it more safe today. On Wednesday, June 22, the Rails-to-Trails Conservancy hosted a Trail Safety Open House to discuss ways to protect users of the Metropolitan Branch Trail from crime. Several nearby residents and trail users attended the event and expressed some of their concerns to government and community representative as well as talked amongst themselves. Now that we've met on the MET, what's next? Public Involvement. The immediate next step includes viewing the great video by the Guardian Angels and then signing up for the MBT Volunteer Safety Patrol. The first patrol will be Wednesday, June 26 - 6:00p to 8:00p at the Pocket park on the trail at S and 4th streets NE. According to Rails-To-Trails, one of the more successful methods used to address crime and safety on trails in other cities has been the establishment of community patrols like the Guardian Angels. Public involvement is an important factor for making the trail safe but good policing is also important. Recently in Indianapolis, IN, three people were attached over an 8 day period while using the Monon Trail. The response by Indianapolis officials included involving extra bicycle officers to complement the 18 park rangers who regularly patrol the trail as well as adding special units mounted units. This is a comprehensive security plan that the District doesn't have. The next steps should be to determine the problems surrounding the trail and determining how to correct those issues. Make it inviting. 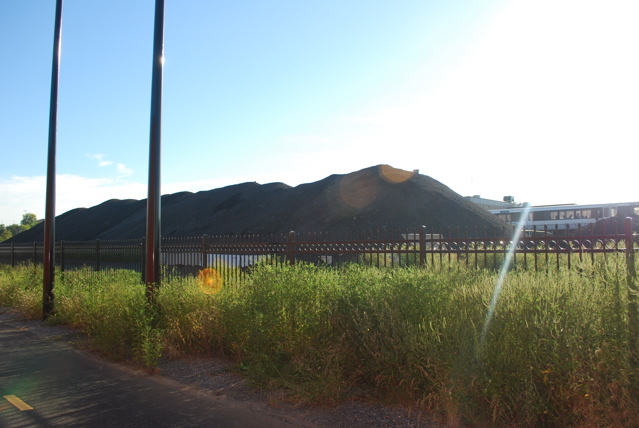 The property between the trail and the WMATA Rhode Island rail yard currently contains at least 3 mountains of asphalt, various construction equipment and concrete casts of sewer mains. The buildings adjacent to the trail include a property called the Sanitary Bakery building, which was purchased by MCI World Network Services in 2000, a Post Office facility, and the Fort Myer Construction Company concrete plant. These businesses could actively support the trail by helping to make their property more inviting. This could be as simple as signage, a mural, or to better organization of supplies. Planting trees or grass on the edges of their property that abut the trail may help reduce the visual impact of the mountains of asphalt. Connect it to the Community. Related to being a less-than-inviting area, the trail should be more than just a transportation corridor especially for those who live north of the area and work in the downtown core. For those who live a few blocks from the trail, there are few signs that show that the MBT exists. Richard Layman of the Rebuilding Place in the Urban Space blog suggested at the open house that better signage on and leading to the trail would both make it easier for users to navigate it but help the community around the trail find it. Also, once on the trail, there is little signage on the trail, directional or street signs (many of which are currently missing). More importantly, there is very little that draws people to the area. The parks at S Street NE and on Rhode Island Avenue NE are relatively narrow with little more to do than just sit on near by benches. Recently, Dan Reed of Greater Greater Washington wrote about public art can draw inspiration from within the community. 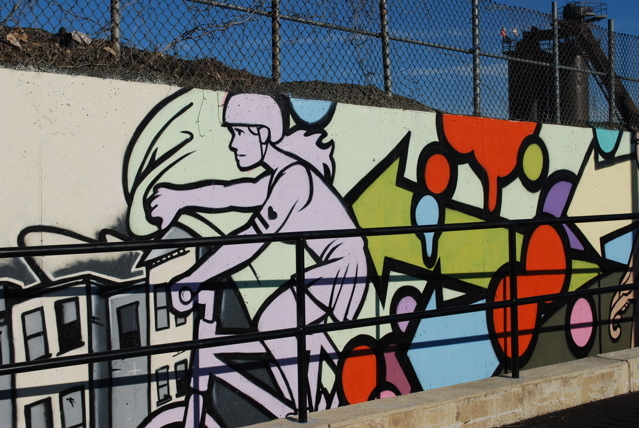 With ample way space and some murals in place, the trail can be a showcase for wall art. Create a Long-Term Plan. Currently the trail acts as a freeway, a strip of tarmac that moves users more quickly than city streets; the trail passes over and behind the community but doesn't have a strong attachment to it. To remedy this, the District needs a community plan for the trail. Much like the District's Great Streets initiative, which according to the District's website, transform under-invested corridors into thriving and inviting neighborhood centers using public actions and tools as needed to leverage private investment. The MBT appears to have the beginnings of anchors as shown by the Rhode Island Station development to the north and the NoMa West residential development at the southern end, just north of New York Avenue NE. This section of Eckington has few areas of green space. If properties adjacent to the railroad tracks become available, it may be prudent for the District to purchase the land and convert some of it to parkland. Along with the MBT, it would provide a lasting amenity to residents and visitors and help create a destination. Making the trail safe involves not only near-term policing but the continuing effort to help it grow. The trail could one day be an access point to a park as well as a city-wide destination. 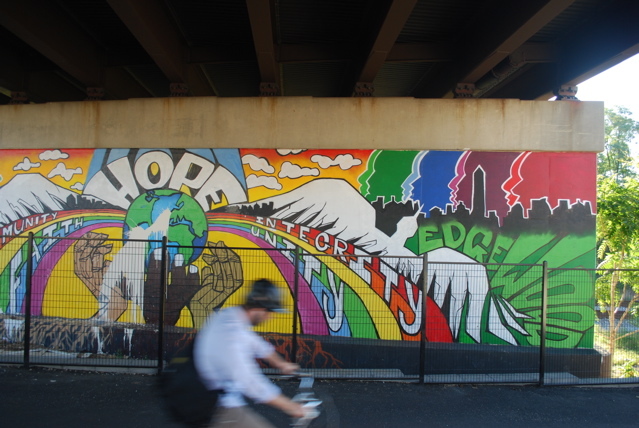 While the development of the trail, the park and the surrounding community may take years, the it could help anchor development just as Meridian Hill Park spurs development at 16th Street Heights.